Donors and nonprofits surpass $1.2 million goal during Give More 24! VANCOUVER — More than 150 nonprofits that provide services in southwest Washington combined forces Sept. 20 for a 24-hour, online giving marathon called Give More 24! The event, organized by the Community Foundation for Southwest Washington, kicked off at midnight on Thu., Sept. 20 and inspired thousands of people to give to local causes online at www.givemore24.org. Part of the draw was the chance to double your contribution through $500,000 in matching funds and the potential to help an organization win one of the nineteen $1,000 nonprofit prizes available. The event’s fifth year also became its largest, with 155 organizations and 3,692 donors partnering to raise more than $1.35 million. Collective donations surpassed the event’s $1.2 million goal at 9:41 p.m. and continued rolling in until midnight, raising nearly $326,000 more than last year’s effort. Rhoads referenced the dozens of official events organized by participating nonprofits and local businesses. Some of the more unique offerings included a mac and cheese eating contest at Mill Creek Pub in Battle Ground, carpool karaoke rides chauffeured by the Journey Theater Arts Group, and a Battle of the Lawyer Bands staged by the Clark County Volunteer Lawyers Program. 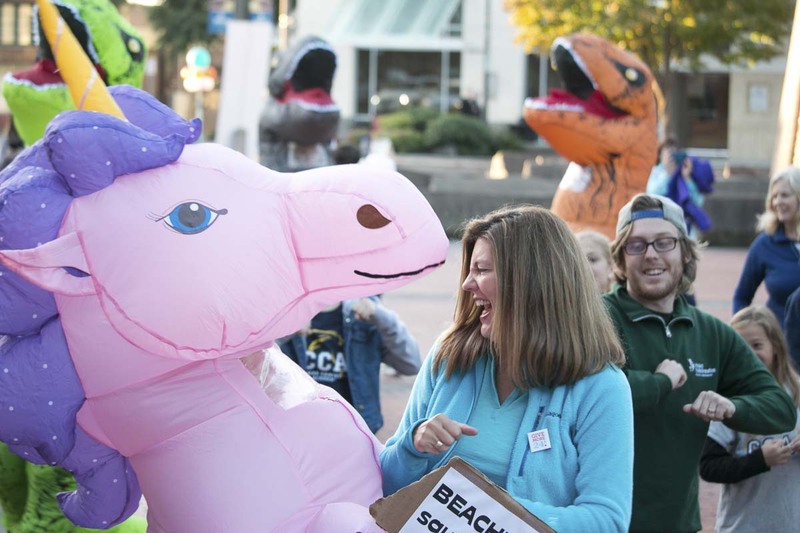 The Community Foundation also hosted a morning rally in Propstra Square that attracted about 100 people, as well as a cast of costumed characters and Timber Joey. During the many events, donors were encouraged to visit the Give More 24! website and make charitable gifts. Here, donors could search through the participating organizations and filter by cause area or location to help identify nonprofits they would like to support. Cause categories include interests such as animal welfare, arts and culture, education, environment, health, housing, hunger, religion, social justice and veterans. As an online event, most donors give from home or work, and some donations even come in from outside the area. This year, 5,749 gifts ranging from $5 to $10,000 came in from 40 states and 3 countries. When the event closed, Lower Columbia School Gardens was the most popular organization with 212 gifts tallied. The most successful fundraiser was Our Lady of Lourdes Catholic School with $82,204 in total giving. While it led the large-sized organizations, Teach One to Lead One ($41,835) topped the medium-sized category and the Southwest Washington Symphony ($29,632) raised the most for small-sized organizations. Looking at the big picture, the causes that attracted the most funds during Give More 24! were Education ($358,405), Health & Wellness ($194,998) and Youth ($192,576). As for total donors, the order changed slightly, with Education (1,445), Health (708) and Homelessness & Housing (664) being the most popular. The bulk of giving came from southwest Washington. In fact, about half of the online gifts came from Vancouver residents (2,783). Longview (589), Portland (274) and Battle Ground (255) were the next most active cities. Davidson & Associates Insurance representing PEMCO Insurance served as the presenting sponsor of Give More 24! Further financial support is provided by power sponsor Bank of America and supporting sponsor Columbia Bank. For full details on Give More 24! including a leaderboard detailing which nonprofits and causes raised the most funds and donors, visit www.GiveMore24.org.